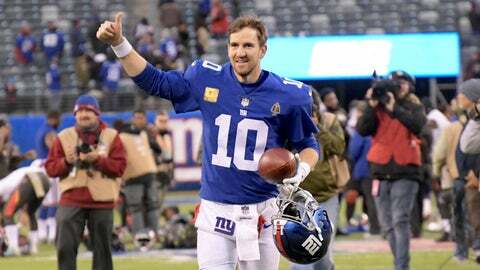 EAST RUTHERFORD, N.J. (AP) — No one seems to be asking questions about Eli Manning remaining the quarterback of the New York Giants these days. The two-time Super Bowl MVP has quieted his critics, throwing for five touchdowns and no interceptions in wins over the San Francisco 49ers and Tampa Bay Buccaneers the past two weeks. In beating the Niners, Manning engineered a late fourth-quarter drive capped by a touchdown pass to Sterling Shepard with less than a minute to play. He was nearly perfect Sunday, hitting 17 of 18 passes for 231 yards and three TDs in a 38-35 win over the Bucs. His 94.4 completion percentage was a team record in a game with at least 10 attempts, and it was tied for third highest in a game in NFL history with a minimum of 15 passing attempts. Alex Smith, when he played with the 49ers, and Ryan Tannehill of Miami share the top mark at 94.7 percent. Manning tied his career high by completing his first 11 passes before failing to hook up with halfback Saquon Barkley on a wheel route. The Eagles have had their way against the Giants. They have won four straight, including a 34-13 win at MetLife Stadium on Oct. 11, a game in which the Giants were down 24-6 at halftime and 31-6 midway through the third quarter. Manning finished 24 of 43 for 281 yards. However, he was sacked four times and threw an interception on the second play from scrimmage, setting up the first of three touchdown passes by Carson Wentz. The 37-year-old Manning didn’t give much of an answer when asked about the Eagles’ recent success against New York. The Giants are playing better heading into this meeting. The two-game winning streak is their longest since December 2016 and they have made changes, particularly on the offensive line. Spencer Pulley is now the center and Jamon Brown has been excellent at right guard since being added to the lineup two weeks ago. Tight end Evan Engram, who missed the Eagles game with a knee injury, is back and Barkley, the No. 2 overall pick in the draft, had his best game last week, rushing for 142 yards and scoring three touchdowns: two running and one on a pass. NOTES: A win by Dallas (5-5) over the Redskins (6-4) would help the Giants on Thanksgiving. Manning isn’t going to root. “We’ll watch the game, but you never know how it’s all going to end up or play out, so just watch,” he said.